Networking and wireless engineers and researchers with functions or titles that include communication engineer, network architect, network designer, systems engineer, network operator, network engineer, as well as product managers and service companies to CEOs, CIOs, etc. Chapter 1 What Are Smart Objects? 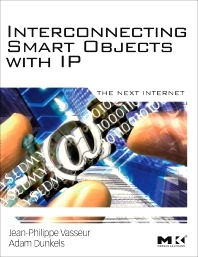 Chapter 3 Why IP for Smart Objects? Adam Dunkels, PhD, is a senior researcher at the Swedish Institute of Computer Science. He is the well-known author of the Contiki operating system, and the uIP and lwIP embedded IP stacks. In 2009, MIT Technology Review named him a Top 35 Innovator under 35, for his work on IP for smart objects.